Barnes & Noble's next Nook eReader may solve the problem of reading in the dark (or rather, not) on an e-ink screen. According to The Digital Reader, the next Nook Simple Touch eReader will use a front-lit display technology that Barnes & Noble calls "GlowLight." As proof, The Digital Reader posted a photo, reportedly showing some in-store promotional signage for the upcoming eReader. 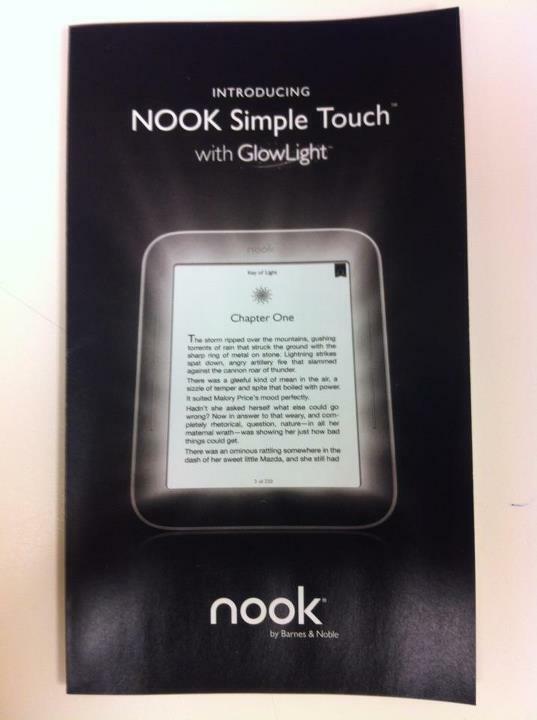 Last week, The eBook Reader reported that Barnes & Noble will use front-lit film from a company called Flex Lighting. The company's technology can supposedly sit on top of reflective touch screens, such as the one used by the Nook, and can be as thin as 0.05 mm. Flex claims that its technology is also more energy-efficient than traditional edge lighting, so a light-up Nook might not take a huge hit in battery life. An official announcement could come on Thursday, or possibly one week after that, The Digital Reader reported. Although eReaders make for easier reading than tablets when outdoors, the fact that you can't use them in the dark without a clip-on light source has been a big drawback. It's not surprising that eReader makers would focus on this issue for their next generation of hardware. Amazon probably won't be far behind with a front-lit eReader of its own. Last week, TechCrunch claimed to have spotted a prototype Kindle with a "glowing" screen. According to TechCrunch's report, the front-lit Kindle will debut later this year. Rumors suggest that Amazon is also working on bringing color to its e-ink displays. Anyway, if you're thinking of buying an eReader, you may want to wait a week or two to see how these rumors play out.